Money can be tight for college students and paying for tuition and books is only the beginning. Creating a comprehensive financial plan is the best way to avoid budgeting issues that can interrupt student progress and prevent degree completion. Review the total costs of attendance provided by the Financial Aid department. Plan for emergencies like medical bills, auto repairs and unexpected travel. It's important to be realistic and leave room for flexibility when creating a long-term budget. Things may change in the time it takes to complete a degree and students should be prepared to make adjustments as needed. Students interested in transferring to Arizona State University after completing a certificate or degree at Rio Salado College can make an appointment to meet with ASU Advisor Chris Griffith this Friday. Griffith is available in the Advisement Office on the 3rd floor of the RSC Tower Building the first Friday of every month. He can discuss ASU programs, steps for admission, evaluation of transfer credits, and any other questions students may have. Call (602) 496-1751 or email ASUChrisGriffith@asu.edu to make an appointment. Rio Salado College students Rebecca Park and Erin Brooke Earnest have been selected as members of the All-Arizona Academic Team. They celebrated their accomplishments earlier this week at an honors luncheon with more than 70 other team members from community colleges across Arizona. Students are selected and ranked based on academic achievement, leadership, school participation, and service. First team students receive a $1,000 cash award, with students on the second and third team receiving $750 and $500 respectively. All team members also receive a tuition waiver at any one of Arizona’s state universities. The recognition is sponsored by Phi Theta Kappa, an international honor society for two-year colleges, the Arizona Board of Regents and the Arizona Community College Presidents’ Council. Third Team member Erin Earnest is a dual enrollment student at Xavier College Preparatory and Rio Salado College. She has been very active in both schools. She is a member of the National Honor Society for Xavier College Preparatory and a member of Phi Theta Kappa Honor Society at Rio Salado College. She is a member of the Xavier College Preparatory varsity swim team and has won four state championships with the team. She also has received awards for swimming and diving. She said she wants to pursue a degree in psychology at either Arizona State University or the University of Arizona, after which she wants to attend graduate or medical school to become a psychologist with a focus on helping autistic children and adolescents. Rebecca Park also placed on the Third Team. She lives in Eager, Arizona and has been taking online classes at Rio Salado College to earn an associate degree in paralegal studies. She has been very involved with her community, volunteering with the youth in her local church and participating in a variety of service projects. She helped clean up neighborhoods, made blankets for orphanages and hospitals and gathered supplies for hurricane Katrina victims. For Park, a mother of four, the flexibility of taking classes online gave her the opportunity she needed, while at the same time working to provide for her family. “I’m really enjoying the setup, it’s been great that I can work and go to school,” she said. Park’s goal is to transfer to Arizona State University to study Political Science and become a paralegal. Being selected for the All-Arizona Academic Team is a step in the right direction. “It’s a good feeling, because I have tried to work hard and do well in school,” she explained. Both students have excelled academically as well as in their communities and by winning a spot on the All-Arizona Academic Team they will also receive an additional $500 scholarship from Rio Salado College. Park is excited for the next step of her education and feels confident that the Rio Salado College faculty has prepared her. “The teachers really challenge you, they push you to work and to learn, so I feel like I am ready for a university,” she said. Members of the United States military have access to a variety of financial aid options designed to help them advance their military career as well as transition to civilian employment. Here is a list of the military education benefits that can be used to pay for classes at Rio Salado College. Tuition Assistance –This is similar to corporate tuition assistance programs and is an employment benefit for active duty members of the armed services including activated National Guard and Reservists. Tuition assistance funds do not need to be repaid. Each branch has its own criteria for eligibility. Interested service members are encouraged to talk to their chain of command for more information. Tuition Top-Up Program – Students who have been approved for federal tuition assistance by a military department who are also eligible for Montgomery GI Bill® Active Duty benefits or the Post 9/11 GI Bill® benefits may take advantage of the Tuition Top-Up Program. This program pays the difference for courses that cost more than tuition assistance will cover. Funds are taken from the student’s GI Bill® entitlement and will be distributed directly to Rio Salado College. Note: Top-Up funds combined with VA funds may not exceed the total cost of the course. Montgomery GI Bill® – The Montgomery GI Bill is an elective program available to service members in the U.S. Armed Forces. Those who opt-in to this program pay $100 a month for 12 months and must complete a minimum service obligation before receiving benefits. Students who qualify for Montgomery GI Bill® benefits are encouraged to contact our Veterans Affairs office to discuss their options with our Military Advisement Team. Post- 9/11 GI Bill® – The Post-9/11 GI Bill® offers education benefits to veterans with at least 90 days of service after September 10, 2001. It is also available for those discharged after 30 days with a service-connected disability. Service members must have been honorably discharged in order to be eligible for Post-9/11 GI Bill® benefits. Students who qualify for Montgomery GI Bill® benefits are encouraged to contact our Veterans Affairs office to discuss their options with our Military Advisement Team. VEAP - The Veterans Educational Assistance Program (VEAP) is an opt-in, 2 to 1 fund matching savings program with limited availability. REAP – Reserve Educational Assistance Program (REAP) is designed to provide assistance to reservists called to active-duty in response to a war or national emergency. Students who are eligible for this program are encouraged to contact our Veterans Affairs office to discuss their options with our Military Advisement Team. Active duty service members, veterans and their families can find additional information and assistance at the East Valley Veterans Education Center, on our Military Central webpage or by contacting the Veterans Affairs Office. Paying for College: Submit Your FAFSA Early! All students should complete the Free Application for Federal Student Aid (FAFSA), even those who don’t qualify for need-based aid. Student may submit the FAFSA as early as January 1, and sooner is definitely better than later! The FAFSA is used to determine eligibility for a variety of student aid sources. As time passes, financial aid sources are depleted of funds and are no longer available. Students who submit their FAFSA in January have access to a significantly larger pool of funding sources than those who submit their application in June. Students are encouraged to complete and submit their FAFSA as soon as they have completed their tax return for the year. This provides students with the best opportunity to receive additional funds. Note: The Rio Salado College school code for the FAFSA is 014483. To read the full story visit http://www.fastcompany.com/most-innovative-companies/2013/industry/education. Adult learners from across the state will showcase their excitement for learning Monday, Feb. 11 from 10:30-Noon at an awards celebration for the I’m in Love with Learning competition. The event is held in conjunction with the ninth annual Arizona Adult Literacy Week, Feb. 10-16, which celebrates adult literacy and lifelong learning in Arizona communities. Nearly 400 entries from more than 1,000 participants will be on display at the Rio Salado College Conference Center, 2323 W. 14th Street, Tempe, Ariz. Entries include paintings, Learning Trees, posters, essays, jewelry, songs, a dance, a bookmark, a 3D traffic game and more. The following awards will be presented that morning; Award of Excellence, Distinguished Merit, Partner Awards and Honorable Mentions. Sponsors of the event are The Arizona Association for Lifelong Learning, Rio Salado College and The Arizona Department of Education. In the 25 adult learning programs across Arizona, nearly 18,000 students take classes to prepare for a GED, improve their English skills and get ready for college. More than 825,000 adults in Arizona don’t have a GED. Those who have a GED earn $8,500 more than those who do not. The benefits of adult education include stronger families, lower crime rates, higher standard of living, safer neighborhoods, and a positive economic impact for local communities. Thanks to everyone who came out for the event. Here's a fun video of the I Love My English Class dance performance. celebrate day one in the brand new clinic. 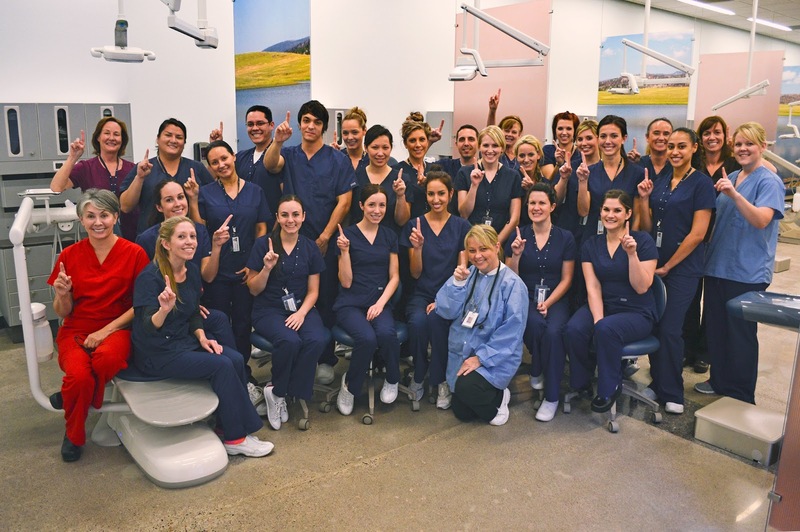 The Rio Salado College Dental Clinic has moved into its new location across the street from the RSC Administrative Headquarters in Tempe. The facility opened yesterday, and provides dental hygiene students with a new learning laboratory environment. An open house will be held later this spring and the clinic will open to the public this summer. Federal student aid programs operate on the basic principle that funding education is primarily the responsibility of the student and the student's family. Those who are supported by their parents are considered dependent students and must include information regarding parental income when filing the Free Application for Federal Student Aid (FAFSA). An assessment of family income is then used to determine how much the student's family is expected to contribute. Even in cases where parents are unwilling to pay tuition or other college expenses, financial aid eligibility is determined by the expected family contribution. Independent students are not required to include parental income on their FAFSA. Parental income will not be considered when determining the financial aid eligibility of independent students. In order to be considered independent for the 2012-13 school year, students must meet at least ONE of the following federally determined criteria. Have at least one dependent other than a spouse or child who receives more than half their support from the student. Note: Parents are not required to pay the expected family contribution. Providing income information on the FAFSA does obligate parents to support the student in any way. If parents refuse to provide financial information, students may submit the FAFSA without it, however this will severely limit the student's ability to use financial aid funding to pay for college.